Demonstrators protesting against Dakota Access Pipeline say they are trapped on a bridge as North Dakota police fire tear gas, water cannon and concussion grenades at them, according to live reports on social media. The demonstration is taking place on Highway 1806, just north of the main protest camp against the pipeline. Officers have deployed water cannon on the protesters in below-freezing temperatures, and are using LRAD sound devices. Earlier, there were reports of rubber bullets fired. Vehicles which appear to be armored humvees have arrived at the scene. A livestream of the incident has been posted to Facebook Live by Kevin Gilbertt, who claims protesters are trapped on a bridge and being forced to endure tear gas. “The options are endure the tear gas or trample each other,” Gilbertt says, adding that other protesters are bringing blankets to those trapped on the bridge. A statement from Morton County, where the protest is taking place, has put the estimated number of demonstrators at around 400 people, noting that one person has been arrested. It went on to state that protesters have attempted to start multiple fires at the scene. "Officers on the scene are describing protester's [sic] actions as very aggressive. Protesters have also engaged in organized tactical movement and attempted to flank and attack the law enforcement line from the west," the statement claims. 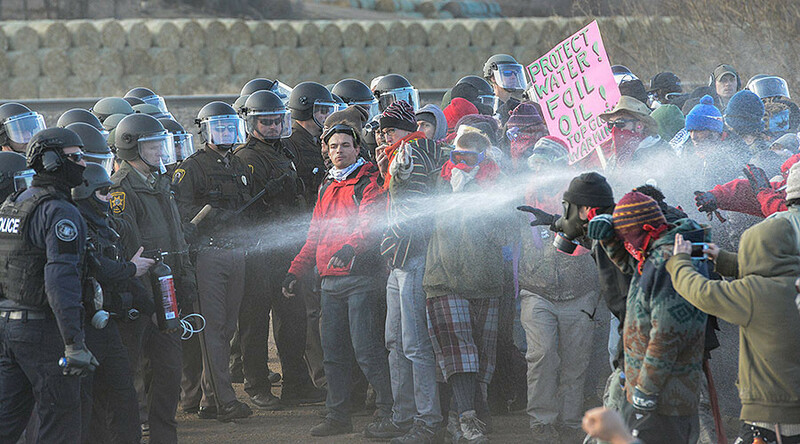 "In order to keep protesters from crossing the bridge, law enforcement have utilized less-than-lethal means, including launching CS gas," it says. An eyewitness interviewed by Gilbertt said the fires at the scene were started by police projectiles, not protesters – contrary to the statement by Morton County. The demonstration is the latest in a string of protests that have taken place against the $3.7 billion pipeline since spring 2016, with the Standing Rock Sioux tribe and environmental activists claiming it could pollute nearby water sources and destroy the tribe's sacred sites. The Sunday clashes reportedly occurred when several anti-pipeline protesters used a semi truck to remove burnt out military vehicles from the area, which were left over from a protest earlier in November. That allegedly prompted authorities to respond by firing tear gas. The pipeline is currently about 85 percent constructed. The only remaining work to be completed in North Dakota is the section which would run under Lake Oahe, according to Energy Transfer Partners (ETP), the main company behind the pipeline. ETP has ruled out the possibility of rerouting the pipeline, with CEO Kelcy Warren saying, "There's not another way. We're building at that location."